On March 11, 2011, the world witnessed one of the worst nuclear disasters. The Fukushima I Nuclear Power Plant was hit by a tsunami generated by a powerful 9.1 earthquake off the coast of Sendai, Japan. The Tohoku earthquake triggered an automatic shutdown of the fission reactions at the power plant, but the tsunami destroyed the emergency generators that provide cooling for the reactors. This led to the nuclear meltdown of three of the four reactors, explosions, and a release of radioactive material. Sadly, the official report shows that this disaster was preventable. Furthermore, nuclear energy is still considered a safe and clean alternative to coal. To promote reconstruction within the Fukushima Prefecture, the central government has allowed the conversion of farmlands into solar farms. Many of the locals lament that food produced from the region will not sell because of concerns about radiation. To make the area more economically viable, the farmers have adopted a style of solar sharing, where solar panels are installed high above growing crops. Japan has a high population density and limited farmlands; the development of land is carefully regulated to prevent over expansion. The solar sharing techniques allow for the land to serve a double purpose: firstly to provide food and secondly to generate surplus power. As Japan tries to implement solar technology, suitable locations to build utility-scale solar power plants are decreasing. But, Japan also has an abundant number of reservoirs that are generally used for flood controls. Kyocera TCL Solar has begun construction of a 13.7 MW solar power plant on the waters of the Yamakura Dam. The joint venture between Kyocera and Century Tokyo Leasing Corporation will be the world’s largest floating power plant. Kyocera has already installed floating installations on two other reservoirs near Kato City. These power plants produce a combined 2.9 MW of energy; enough for 920 households. The solar panels are installed on a floatation system that suspends the panels a few feet above the waters’ surface. Interestingly, the panels serve multiple purposes. Not only do they provide energy, they also prevent water loss due to evaporation. The proximity to the water also cools the panels, increasing the power they generate. The shaded pool also prevents algae growth. This parallels the shade balls used on the Los Angeles reservoir to conserve water, but with the added bonus that the pool is now generating power. Japan isn’t the only country flirting with the idea of floating solar panels. A big draw is the increased efficiency the panels have compared to roof or building mounted panels. The Jamestown project in Australia is the first floating solar system sponsored by Infratech. Unlike the reservoirs in Japan, these systems float the solar panels on pools within a wastewater facility. The solid support system that the photovoltaics are mounted on are coated to prevent corrosion. The UK has shown an interest too, by repurposing the Walton-on-Thames’ Queen Elizabeth II reservoir with a 6.3 MW power plant. The 23,000-panel array powers a nearby water treatment plant that is the source of drinking water for London’s and southeast England. 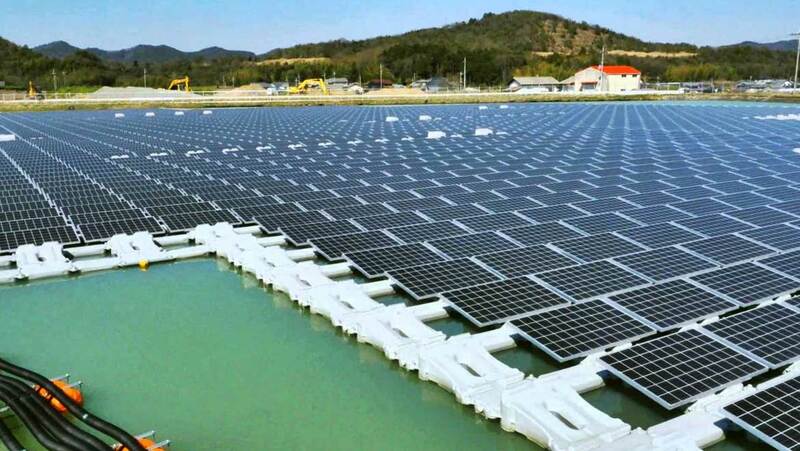 This floating solar array is the current record holder as the largest floating solar plant until Japan finishes the Yamakura Dam project; as here Kyocera plans on using over 50,000 solar panels. Brazil has relied on hydroelectric energy to power three-quarters of the nation, but the country is currently suffering through a devastating drought. To stave off the energy crisis, Brazil is now looking to diversify its power grid and has announced pilot testing of floating solar power systems on the Balbina hydroelectric plant. A 10 MW system was put in place in March of 2016. Again, the shading effect of the solar panels reduces water loss due to evaporation, particularly poignant in a drought-ridden country.